The alarm went off at 6 am every day. The parents and their two children always followed the same routine. The silence in Lucas's house was overwhelming. His mom, Célia, worked in retail and would come home early to make dinner. His physical therapist dad, José, regularly came home very late. His sister Mariah, worried about passing her university entrance exam, was always studying. One day the silence broke during breakfast. "Look at this, it's absurd! Gangs of graffiti vandals were competing to see who could reach the highest point on the building. They marked it all up. The city had spent millions on the paint job," said José, shaking his head. "I think the politicians deserve it. Instead of building public hospitals, they worry about what buildings look like! Meanwhile, people are dying in the lines waiting for free healthcare!" Célia cried passionately. "Whatever, I don't own the building. All I care about is seeing my name on that university admissions list," said Mariah, shrugging. "And does it say whether they identified any of the artists?" asks Lucas, biting into a piece of bread. "It doesn't say anything about that," replied father. "What happened to my dress? It's completely stained!" "Mariah, how many times have I told you not to mix colors in the washing machine?" Lucas chokes. He gets up and goes out for his internship. His cell phone rings. He doesn't answer. Later he reads the text message. "I won't be back until later today," said José. At night, mother and daughter watch the soap opera. On the other side of town, Lucas meets with his group for yet another competition. "That old tall building is perfect. It's probably just a bunch of old geezers living there; just think how they'll react tomorrow!" said Pietro, laughing. They start the climb, armed with paint. In one of the 26th floor apartments, it's romance time. Lit candles, ylang ylang aroma. Suddenly, from inside the room he can see a shadow and hears a noise. Is it an intruder? The man rushes toward the window with a racquet in his hand. Meanwhile, clueless, the woman calls for him. The wind ruffles the curtain. He sees something. "You?!" yells the young man, losing his balance and falling without another sound. Shocked, the man stands frozen, watching his son drop. LETÍCIA UCHA was born in Porto Alegre and is a lawyer and journalist. She has participated in several anthologies published by Câmara Brasileira de Jovens Escritores (CBJE - Brazilian Chamber of Young Writers) and her stories appear in collections published by All Print (Minas Gerais and São Paulo Biennial Book Fairs of 2012). 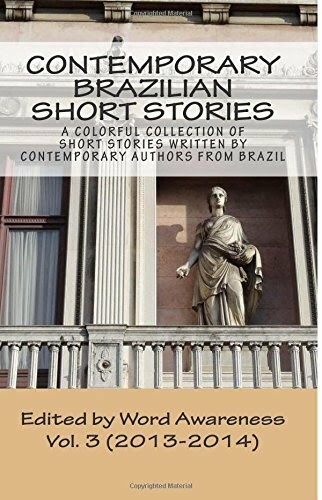 Three of her stories were selected for the 2012, 2013 and 2014 annual editions of the CBJE's Brazilian Literary Panorama - Best Stories. She published two flash stories in a project called Tira Bacana.